48% of large acre corn/soybean growers send 5 or more text messages a day! That’s just one of the findings from a survey conducted by Nicholson Kovac. In this week’s program you can hear Sheree Johnson, Nicholson Kovac Senior VP and Director of Media talk about their findings. Just when I was about to write a post inspired by Jeff Jarvis, on media measurement I received the announcement about the agency survey and it’s a lot more relevant to you agrimarketers out there. Nicholson Kovac took the initiative to survey growers to find out information that is needed by agencies and companies who are having to make decisions on media choices to reach their customers. Well they sure found out that farmers are online and involved socially. Also amazing is how much they depend on and use their mobile phones. Here’s some more information on what they found. 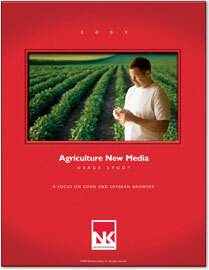 Sixty-two percent of large acreage, U.S. corn and soybean growers have sent or received text messages during the past year, according to the newly released Agriculture New Media Usage Study (corn and soybean segment focus), conducted by Nicholson Kovac, Inc. (www.nicholsonkovac.com) The Agriculture New Media Usage study is the first-of-its-kind in the agribusiness industry. It provides comprehensive insight on the use of social media and new media among large acreage corn and soybean growers – including Internet usage, social networking and mobile phone activities − for business and social purposes. In addition to the percentage of growers sending or receiving text messages, the study reveals the high degree of frequency of texting, as well as other mobile phone activities such as taking photos, e-mailing, downloading ring tones, accessing GPS and more. Forty-eight percent of those texting send five or more texts per day, and 63 percent of respondents indicated they have taken pictures with their mobile phones. The study also explored the presence of crop producers on Facebook™, Twitter™ and other social networking sites. It also details growers’ usage of blogs, forums and/or message boards. Search engine usage and preference were also explored. You can purchase a full copy of the study on their website. Read the full release here. So, listen to my conversation with Sheree as she reviews the results of the survey and we discuss what they mean.